Environmental Protection and Sustainable Development are the two major design themes for this Residential and Parador Resort project. The protection of the land to maintain the relative undisturbed, natural and low-key quality of the island and sustainable development to contribute to the long-term sustainability of Culebra Island are the central policy concerns of this project. These themes promote the environmental preservation of the specific development sites and the outer reaches of the island’s fragile terrestrial, coastal and marine ecosystem. In addition, the development concept is sensitive to the concerns of local residents and will ensure the area’s unique historic, cultural and physical character will be integrated into the project. Culebra’s limited, but episodic rainfall, dry forest vegetative environment and sunny Caribbean island natural setting requires sensitive environmental management and a commitment to conservation of its ecosystem. The Villa Mi Terruño Village developer established from the outset of the conceptual planning, a commitment to natural resource conservation and a design criteria of sustainable physical development with conscious respect to fauna and flora, watershed areas and other significant parts of existing eco-systems. Environmentally sensitive and significant forest habitat areas will be identified and protected and units of development will be sited on lower impact areas. All mature trees and all cacti are considered treasures, that require strict protection and conservation. Terrain features, natural land-forms, and ridge lines will be respected. Home sites are carefully introduced into the landscape below dominant hill profiles and other significant site specific features. 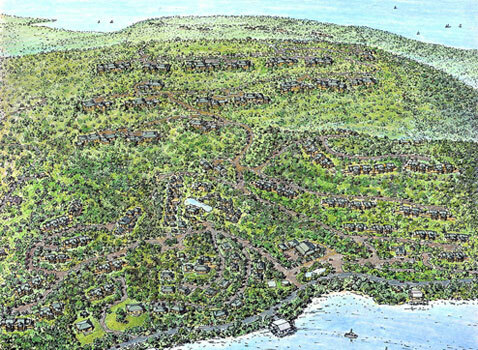 A “Bay Site” site organization strategy will set the development plan, defining specific home-site locations (GPS locations) within the property to minimize development impact and insure the maximum of natural resource conservation of the indigenous vegetation in the remainder of the property and to minimize non-sustainable irrigation. Water and watershed resources shall be protected and developed for conservation purposes. Detention ponds are planned to enhance the limited watershed resources that are presently lost as runoff and thus improve the natural habitat. The development design criteria require the conservation of rainwater through the use of cisterns, and constructed wetlands. Water, energy efficiency, waste management, recycling programs and conservation are also core development goals. The development design program also makes use of passive and active solar strategies to capture and store energy, employs energy efficient lighting, integrated control systems and renewable energy design to reduce the development’s overall energy requirements.